5:11 am Real alarm goes off. Hit snooze. 5:15 am Hit snooze on phone alarm. 5:25 am Get out of bed and get ready. Drink orange juice and eat Honey Bunches of Oats with Almonds (same breakfast every single day) while checking email/facebook/twitter. 6:16 am Drive to school. 6:24 am Arrive at school (8th car in parking lot). Stop by main office to pick up mail and write a morning announcement about the after school Student Council meeting. Put lunch in math department fridge. Having my stations lab already set up for first period, and remembering that I had already updated the objectives/agenda for the day, made me so happy. It’s the little things 🙂 I logged into my computer and chatted with a STEM team colleague about our weekends. 7:00 am Met with Principal regarding a class officer issue. Solution reached. 7:20 am Took homeroom attendance. Ran to 4 other homerooms to remind students going on a field trip tomorrow to bring in their permission slips and show up on time. 7:35 am Period A begins (Algebra 1). Today was a block day so we had class for 85 minutes, normally our periods are 48 minutes. We reviewed the homework assignment, a MCAS open response question, by having the students correct a partner’s paper. Then, we did this W-R-I-T-I-N-G Equations Stations Lab. It went really well, and many students finished it more quickly than I thought they would. So I directed them to Visual Patterns… Thanks, Fawn! 9:05 am Period C begins (Algebra 2). We started class with a mini quiz on Functions (domain, range, parent function transformations). Then, we took notes on the characteristics of absolute value functions and practiced with some links. Class went just OK. I don’t love starting with a quiz and then having students take notes, but I didn’t see a way around it today. 10:30 am Lunchtime. I eat with the math department, it’s a great time to catch up with everyone. 11:00 am Period E begins (STEM Common Planning Time). We review/choose dates for our Term 2 project and update our project guidelines document. We also plan tomorrow’s project work period and finalize details for an 8th grade visit to the high school. 12:30 pm Period G begins (Algebra 1). Same lesson as Period A, but the lab takes longer and no one gets a chance to play with Visual Patterns. 1:55 pm School ends. Student Council meeting begins. We run through some normal agenda items and then write letters to soldiers (a school wide service project). 2:45 pm Back at my desk. Respond to a few more emails. Received 32 throughout the day and sent 15. Pack up stuff. 3:05 pm Drive to nearby school for Administrative Internship class. Today’s topic is “What to Expect When You Move Into Administration.” I don’t know when in my future I’ll move into administration, but I had an opportunity to be part of a licensure program this fall and took advantage of it. It was great to get the prospective from educators who had gone through the same process. 5:45 pm Leave class and drive to Burlington Coat Factory. I needed a new winter coat and I found just the perfect one! Black, knee-length, belted, and with a detachable hood. 6:30 pm Drive to gym for Zumba class. Zumba! Drive home. 8:30 pm Sit in favorite spot on couch. Prepare to watch the Patriots game. Write this blog post. This entry was posted in algebra1, algebra2, MTBoS, STEM by growingexponentially. Bookmark the permalink. Hi Heather. 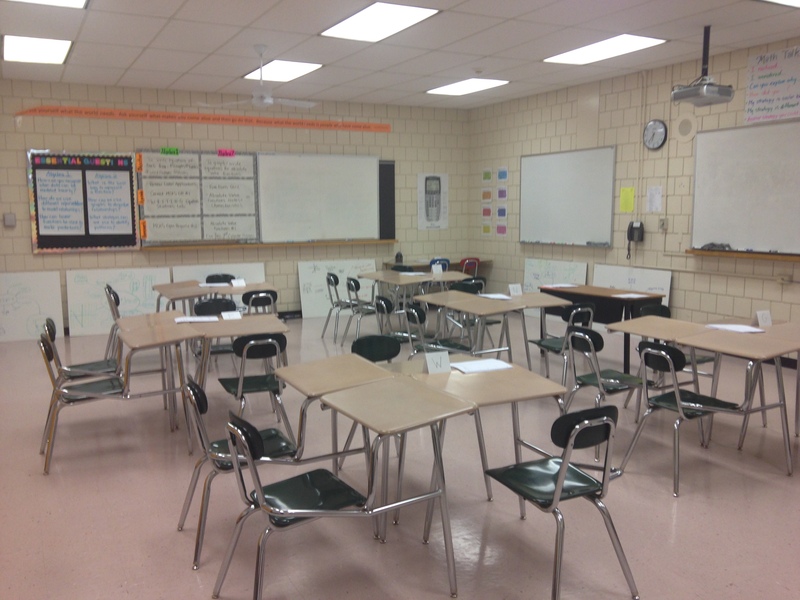 Your room should be cited for being “abnormally tidy” for a classroom! Sheesh, way to make the rest of us look bad. Fawn beat me to the sad reminder of the end of the game. 10:30 lunch? Yipes – that would take me some time to get used to. I understand what you say about starting with a quiz. One of the management issues for me is that kids finish at such a different pace. Maintaing peace while the last ones finish AND regathering everyone else is a drag. Thanks for sharing and good luck with the STEM initiative. We’re in our baby stages of it here. Thank you for sharing your writing equations lab. This is exactly what I needed to review a linear functions unit in Alg 1!